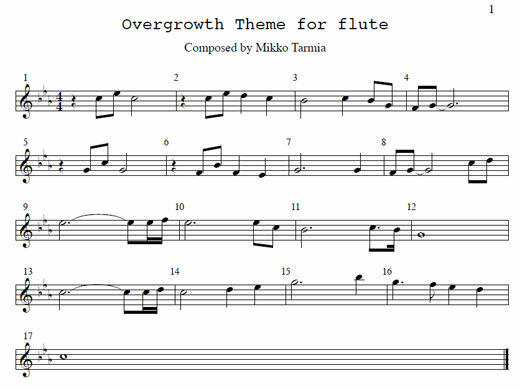 This is a post from Mikko Tarmia, who composed all of the music for Overgrowth. It's quite common for movies to adapt their scores into single-instrument arrangements and then sell the sheet music along with their soundtracks and other merchandise. But how about game music? You don't have to go too far with Google to find sheet music for Final Fantasy and other games, but there are so many versions to choose from that it's hard to know which ones are correct. Surely the ones they sell in stores are great - made by professionals - but if you're lucky you can find great versions made by game music fans, for free. When Anton introduced me to his cool arrangement of the Overgrowth theme for guitar, I thought it would be awesome to have an arrangement for piano too. So, we decided to create pdf files of these arrangements so anybody could download and play them. I also made a very simple version for flute (or any instrument you want to play it with), so now there should be something for everyone. Please enjoy! Making a piano arrangement out of the theme was quite effortless because it was done with the keyboard in the first place (before any orchestrations). The melody and harmony were already there, so I just needed to figure out how to make it more interesting when there's only one instrument to play with. I tried to be quite faithful to the orchestrated version, but ended up using some expanded chords for a richer sound. I'm not a great piano player myself, but I wanted to have a small challenge for more advanced players without making it impossible to play for players with less skills. This one requires good coordination skills especially from the left hand. If it's too difficult, I also wrote down the chords so you can accompany the melody more freely than it's been written in the sheet. Here's the audio version of the piano arrangement, which also works well as accompaniment if you want to play the melody with other instruments. It's nothing too fancy (made with piano samples), but by listening to it you can hear to how the arrangement is played. In the following section, Anton Riehl tells the story behind his arrangement for guitar. Last October, Wolfire posted a tech video on YouTube featuring their new animation mixing UI and somehow a different video was mislabeled with the same title. Oddly, the video was of a guy in his room playing classical guitar, which clearly had nothing to do with Overgrowth or animation user interfaces. So naturally my first thought was, wouldn’t it be funny to play the Overgrowth theme on classical guitar and send it to the guys in IRC (who at the time were all sharing the incorrect link with each other). I happened to be recording some guitar that morning for another project anyway, so I figured it was the perfect time to record it. I didn’t have too much time, so I quickly transcribed the beginning of the theme, and set to recording it. After about an hour, I had a fairly decent performance, and sent it off to the world. What happened next was not what I expected, I actually really liked the way it sounded. Something about simplifying the music to just a melody and harmony really brought out the beauty of the music. I felt it gave an intimate appeal to something usually so grand and epic. I shared this introduction with a few other people and received some very strong reactions and thought I would need to arrange something longer. Unfortunately, my schedule became quite hectic, and making a longer version seemed out of the question. Recently though, I was hanging out with most from the Wolfire team, and the idea of finishing that version came up. So after my trip I spent another couple hours transcribing and recording a longer version. I also realized that many people had asked for the written music, so it seemed appropriate to write out the music so anyone could learn to play it. If anyone is interested in the technical aspects, I recorded using both an EV635a and an SM7 microphone into ProTools straight through my 002. I used Altiverb as my reverb. My EV635a is an old and surprisingly cheap microphone, but has some very distinct characteristics that I like on the guitar. It adds a lot of the attack on the notes, especially in the high register. It’s also the same mic I’ve used to record the ethnic flutes used in the official Overgrowth main theme, as well as the ambient tracks that have been released. I hope you enjoy this alternate arrangement and I hope to hear your performances of it (there's already been at least one confirmed recital)! Are there any other arrangements of the theme you would like us to create?